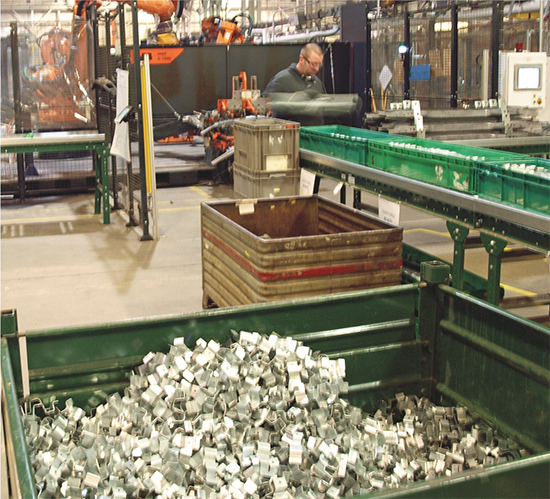 Chris Richards, director of engineering at Wellington Industries, Belleville, MI, calls the company a ‘go-to’ stamper for side sills, A and B pillars, reinforcements and more,” noting how much takeover work that has landed at the company in recent years. The shift began during the automotive downturn, and continues today through the industry’s recovery. At the entry end of Wellington’s latest ABB robotic-welding cell, used to assemble bumpers, a series of resistance-welded subassemblies make their way down a conveyor belt. An operator loads the subassemblies into a large turntable positioner (seen here just over his right shoulder), which indexes the fixture assembly into the welding cell. The cell welds a reinforcement plate and an array of clips and nuts to the boron-steel bumper beam. But more significant to the growth of the company—over the last few years and projected on for the next several years—is Wellington’s expansion beyond just, as Richards says, being a “hit-and-ship stamper,” and becoming a go-to source for welded automotive assemblies. To be more precise, it’s supplying welded front-end modules and bumper assemblies to OEMs as well as to Tier One suppliers. That move started in 2010-2011. “They (the Tier One companies) brought the design intelligence to the table, and we developed the manufacturing IQ needed to engineer, stamp and assemble new front-end modules,” says Richards. We’re talking supporting production of the higher-volume models. Wellington operates out of a pair of side-by-side facilities in Belleville—its original 150,000-sq.-ft. stamping plant outfitted with 15 big-bed mechanical presses, and a neighboring 100,000-sq.-ft. assembly facility the firm took over in 2010. This facility is home to eight robotic-welding cells. It’s this more recently inhabited assembly plant that “represents the new look of the company,” Richards says. The firm’s foray into high-volume assembly dates back to 2010 when, responding to a request from a Tier One supplier, it took over front-end module assembly for a popular model. To meet the required just-in-time next-day delivery requirements, Wellington installed a robotic-welding cell within an e-coating facility. Next, late in 2011, came another burgeoning program for another Tier One supplier, a takeover job that proved a perfect fit for Wellington’s goal to become a prime source for front-end modules. The first two robots (far right, top photo) in the bumper-assembly cell make resistance spot welds to hold the bumper components in place, functioning as tack welds for further welding operations. 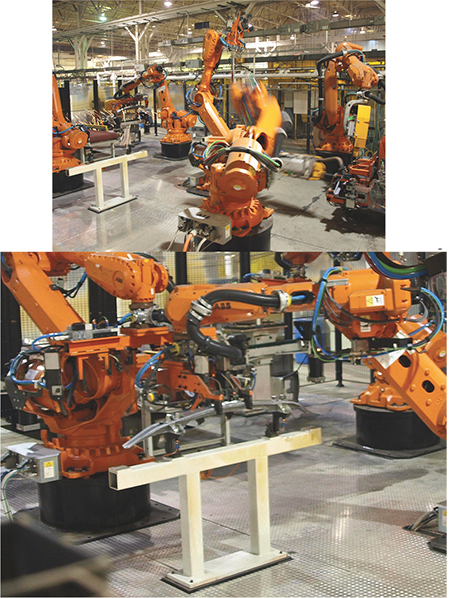 Then, three material-handling robots (bottom photo) take over, moving the assembly through a series of operations in stationary resistance-welding machines. The cell pumps out more than 100 bumper assemblies per hour. With an impressive pair of robotic-welding projects under its belt, Wellington had made its mark. In short order, it added a third ABB robotic-welding cell, to fabricate upper cross members. Next came a pair of robotic arc-welding cells used to assemble both steel and aluminum parts. This work required Richards and Wellington to tackle unique challenges. In addition to predicting (using simulation software) and adapting its metalforming processes to accommodate the heat input from arc welding, Wellington also has adopted the MIG-brazing process on certain assemblies. This process promises to deliver significantly less heat input than does traditional gas-metal-arc welding. MIG brazing, using power supplies from Fronius, employs a copper-based filler wire with a relatively low fusion temperature—typically 1600 to 2000 F—and weld current typically in the 40- to 130-A range. The relatively low process temperature—no fusion of the base material takes place—generates several benefits, including minimum distortion, less zinc vaporization and fume generation, and reduced or, in some cases, eliminated weld spatter. Most recently, Wellington commissioned, in mid-2014, a five-robot assembly cell for robotic welding of bumper assemblies. Assemblies include a large hot-stamped, hat-shaped, aluminized (40 g) boron-steel bumper beam and a host of welded attachments—backing plate, brackets, nuts, etc. A lineup of nine manual pedestal resistance-welding machines feeds subassemblies into the huge ABB robotic-welding cell where five robots toil—two welding robots and three that serve as material handlers. At the entry end of the robotic-welding cell, a turntable positioner indexes 180 deg. to swing the fixtured components within reach of a pair of spot-welding robots. These perform what amount to tack welds to hold the parts within their tight dimensional tolerances for the remaining dozens of spot welds made throughout the cell. Following this quick blast of resistance tack welds, the assemblies move to idle stations where material-handling robots swing in, pick up the subassemblies and move them through a series of stationary weld stations. This finely tuned ballet of robotic motion yields completed bumpers at a rate of more than 100/hr. Specified equipment for the newest of Wellington’s robotic-welding cells: ABB newest models of large robots, IRB 6700 models rated to 235-kg maximum payload and boasting a reach of 2.65 m. ABB describes the seventh-generation robots as offering a 15-percent decrease in power consumption compared to previous models, along with a 20-percent reduction in total cost of ownership, double the time between service intervals and an average increase in speed/shortened cycle times of 5 percent. Electrode force must be greater than 300 kg, to ensure the workpiece materials are kept firmly in place and will fuse correctly at the spot. With weaker electrode force, the sheetmetal may explode (spark fiercely) and leave porous, weak welds. Welding power needed to correctly fuse the steel must be at least 8000 A for the entire welding process, not just for a momentary spike of power at some time during the weld. Each spot weld must have a very small burn mark around it so that the strength of the steel remains constant. With lower power or longer burn times, the welds will have a bigger burn mark and the integrity of the welds will be compromised. Weld tips should be flat, not domed or pointed. The essence of the profile is to give a flat weld that does not push into the surface of the steel, which would in turn weaken the steel at the spot. Part of the success of this safe yet speedy cell operation must be due to a couple of key features inherent to the robot controller (ABB’s IRC5): QuickMove and SafeMove. The QuickMove feature optimizes motion control based on the complete dynamic model of the robot that resides within the robot controller. QuickMove optimizes acceleration to enable the robot to reach its programmed positions in the shortest possible time, in turn optimizing cycle times beyond applications that depend solely on robot-axis speed. In addition, the IRC5 robot controller features the ABB TrueMove function designed to ensure that the robot follows the prescribed motion path regardless of its speed. Along with the emphasis on eliminating weld expulsion, Wellington has begun to focus on avoiding cold welds. Here, again with ABB’s help, it has been installing poka-yoke devices to check weld current after each tip dressing. The robots bring their weld tips over to these current-check stations where they send current through a puck, or blank, of steel. Yet another resistance-welding productivity boost came in 2010 when the firm began to switch from pneumatic welding guns to servo guns. “The servo guns are very accurate, and the welding process becomes much more repeatable,” Richards explains. “With pneumatic guns the list of process variables impacting weld quality and consistency is long, including ambient air temperature and humidity, and the quality of the air coming from the compressor. In many cases we would have to over-pressurize the pneumatic guns to make up for process variables.